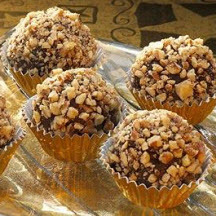 Rich, dark chocolate truffles rolled in your choice of coatings. Combine chocolate chips and cream in medium microwave-safe bowl. Microwave at HIGH (100%) 1 minute; stir. If necessary, microwave an additional 15 seconds at a time, stirring after each heating, until chips are melted and mixture is smooth when stirred. Roll mixture into 1-inch balls. Roll each ball in coating. Cover; store in refrigerator.